The Friends of Holy Saviour Church invite you to their next “Talk & Tea“ on Sunday 25 September at 3pm in Holy Saviour Church. The poetry of Christina Rossetti has always been popular – known to many from childhood readings of “Goblin Market” to “A Birthday” and “Remember” and from the words of the ever popular carol “In the Bleak Mid Winter”. 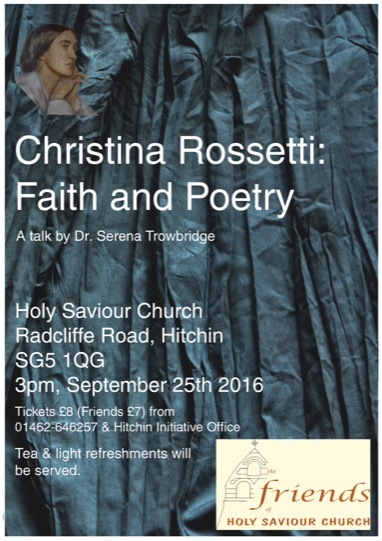 This talk, by Dr Serena Trowbridge, will explore Rossetti’s poetry, her life and faith, and the influences which helped to make her an exceptional poet. This entry was posted in Events on 15/08/2016 by admin.